[Healthy Sanitary Protection] This bidet sprayer leaves you feeling cleaner than conventional paper and wet wipes. Equipped with brass sprayer for rear wash which offers refreshing hygienic wash for your families. Extremely useful for people with haemorrhoid, obesity, hypertension, infirmity due to age, and children. It can be used for every month of the cycle and is strongly recommended by new or prospective mothers. [Egronomic Design] Easily wash with only one hand, save you time and trouble, more hygeian, no need to turn off the water, it\'s self-closing, super convenient; Please pay attention to turn off the valve (T-adapter) for cutting off the water when not in use the cloth diaper sprayer. 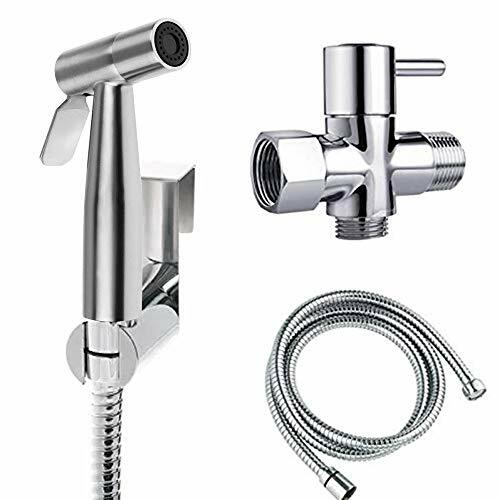 [Durable Material] Stainless steel 304 ( Top grade of stainless steel ) sprayer, high quality stainless steel anti-explosion 1.2M shower hose, brass valve and spray holder, rust resistant, durable for many years use, Do not worry about leak any more with this toilet spray. [Multiple Uses] This handheld bidet sprayer set could be mount to everywhere in your house with hot or cold water: bathroom, kitchen, garden, garage as a pet shower, Muslim shower, toilet seat washer, cloth diaper, washer flusher, kitchen faucet, car shower sprayer, water flower tool etc. Especially ideal for people with pregnant, children, feminine hygiene, hemorrhoid, obesity or hypertension to wash your bottom with soft/strong water by pressing the button. save money and great widely using. [Easy Installation] This bathroom bidet box contains everything you\'ll need for a bidet sprayer installation within 10 minutes. Our step-by-step instructions with pictures simplifies neatly mounting to toilets, walls or showers in minutes without a professional plumber. An elegant wall/toilet tank mount.